Do you want to be my Facebook Friend? If you don’t want to go through your business life like Michael Scott from “the Office”, you may want to think twice before adding all your colleagues to your Facebook profile. Social life in an office environment is sometimes difficult to navigate. Some offices have groups of friends who all hang out together and participate in the local lottery together and you don’t want to be the one left out, other office environments look more like warfare and have complicated office politics. They just started with Facebook and happily leave the website to use their whole address-book to find “friends”. It would be safe to ignore these requests. The Facebook program suggests “other people you may know” and they blindly clicked on the links, requesting you has a “friend” as they mistakenly saw the suggestion as a friend request from you. These invitations can also safely be ignored. They are new to the company and want to immediately get familiar with all people they work with. You are new to the team and they want to get to know you better. “Friending” can be a very nice and powerful tool to help you in your social life, business life and career but it all depends on if you know what you are doing and if you keep your focus while sharing and living the life online. AVG, the internet security company has done some research and issued some warnings and tips in a video about this phenomenon. No one would probably be happy showing the drunken bachelor(ette)s party pictures around their place of work and you should ask yourself if it is wise to even show these pictures online at all. Remember, your Facebook posting can get you fired or hamper your promotion potential. Many companies ban Facebook and other social media from their systems although I believe that this is counter productive and it should be fine for your team to have some quick breaks during the day and catch up with their social life, also with the flood of 4g phones and tablet, people can be assumed to be online during the whole day anyway. 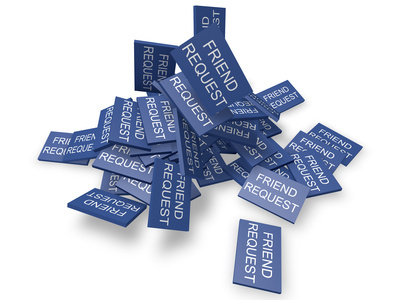 Turning down Facebook requests by colleagues is not a big deal, telling them that you use your Facebook mainly for your extensive family circle should be enough of a reason. Some people even go as far as having two separate Facebook accounts, one for friends and one for the office. Celebrities and businesses create fan pages but keep their Facebook profile clear from fans, clients or customers. Amber McArthur has written the book on PowerFriending and she gives some tips for businesses to get online and be successful in the social media. Never feel forced to sign someone up as a Facebook friend, ignore the requests or turn them down or, if you have accepted them as a friend already, learn about the tools to hide their comments on your Facebook page, leave them out of postings you do or even unfriend them, chances are they won’t notice it. In most situations I would suggest that you keep your friends and business colleagues / team members / associates or business partners separate, both at your birthday party at home and at your social presence online.